Our entire day was devoted to fitting the ladder, track, and head piece. 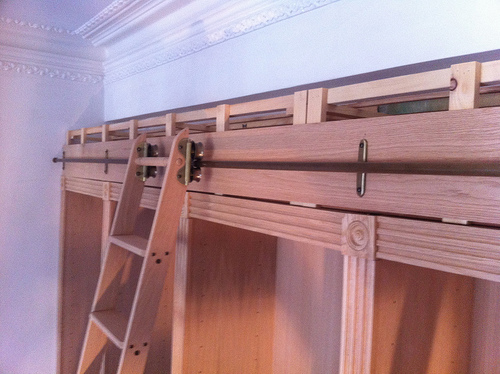 This proved to be challenging due to the nature of an un-square house and un-level floor. First we had to build up a support structure to allow us to nail the head piece in. Then we had to assemble the ladder in order to find out if there was enough clearance for it to clear the head piece in its away position. 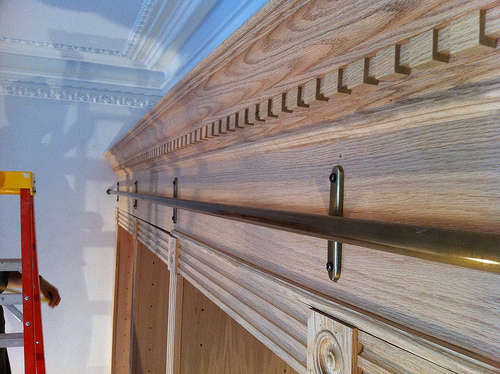 Once we got everything just right we could screw the track to the cabinets. After that long day was over, we stained 32 shelves Minwax Jacobean brown until the wee hours of the night. Day six will be focused solely on staining the rest of the cabinets so stay tuned for finished more pictures. For now, visit the Victorian Library photo set on Flickr.